Here is our guide to assist you in booking your trip. Step 4 – Check your email. You will be receive booking information. Step 5 – If you choose Pay Later option. We will send payment invoice link to pay with credit card or PayPal account. 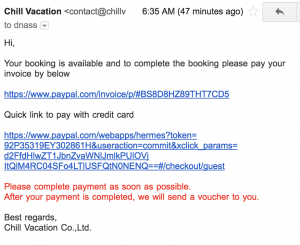 Step 6 – You pay invoice and we send a voucher to confirm the booking.